Cover Art: Rob Liefeld & Romulo Fajardo Jr.
Now that Marvel Studios have the cinematic rights back to the X-Men, maybe we will see more new X-men characters created. Rumors swirled that Marvel Comics had put the kibosh on any new characters who would be mutants because if they made a new mutant character, the rights would go to FOX. Hence, all of the Inhumans that we got for several years. Now, with the term mutant happily back under the umbrella of Marvel Studios, we can have new X-characters. So they decided to start with this guy? 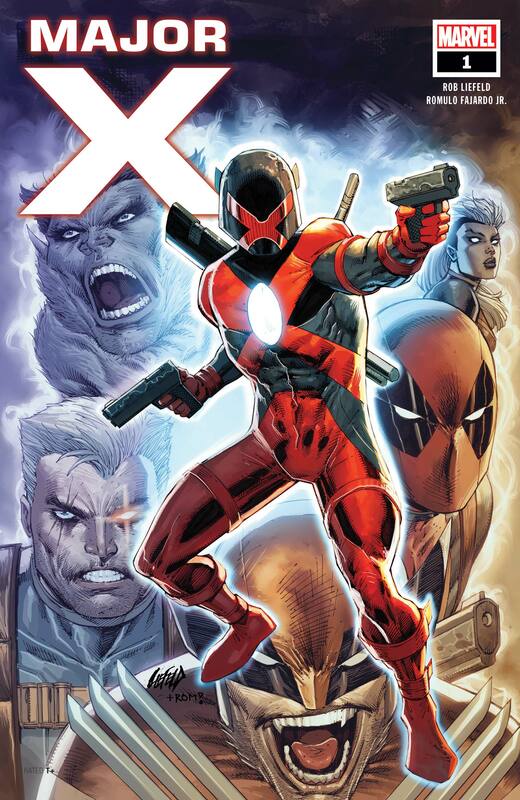 Major X, the new character created by Rob Liefeld, has his own book and it was not good. The writing was so childish and downright weak. The dialogue was immature and it felt as if it had been written by some of my 7th grade students. The story dropped the new character into a time in the X-history, seemingly, when Cable was alive and the X-Force team was just forming. Deadpool did not know people either. Of course, the book never lets us into that timing, never telling us when this was happening. The story, as it was, was basically Major X coming back in time to find Cable, I guess, and something something. It was all just an excuse to have these heroes fight one another. In fact, I am literally looking at two pages of the comic where seven of the 11 panels are Cable, Deadpool, Wolverine or the new future Beast they were calling M’Koy, punching the others with a punch. Terrible. Then, Rob Liefeld made his name with his art during the hey days of the 1990s, but this art in Major X #1 is anything but good. It looks like a considerably less talented artist trying to copy Liefeld’s work. The fact that it is Liefeld is not a good sign. I have been moving away from X-Men books over the last several years and this issue certainly will not stop that trend. I have no intention of adding this to my pull list, even with the obviously cliched answer of who Major X really is. No Spoilers, but it could not be more cliched. Not a book I would recommend unless you want to sit down and riff it.